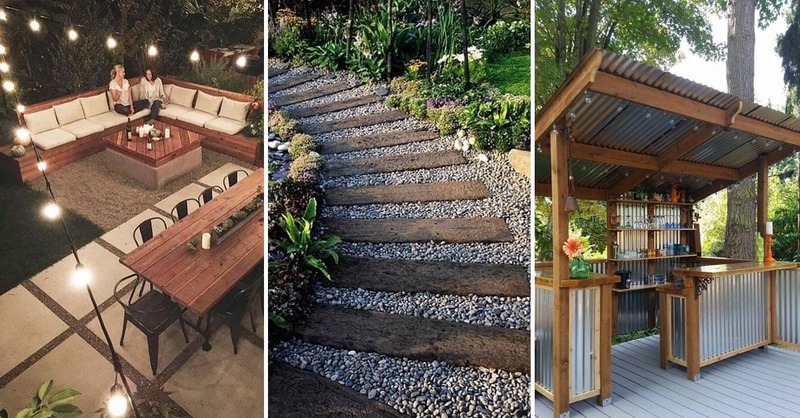 Welcome to our photo gallery featuring 40 Stunning Landscaping Ideas for Backyard and Front Yard. Being a homeowner means you have the privilege of crafting your own living space. 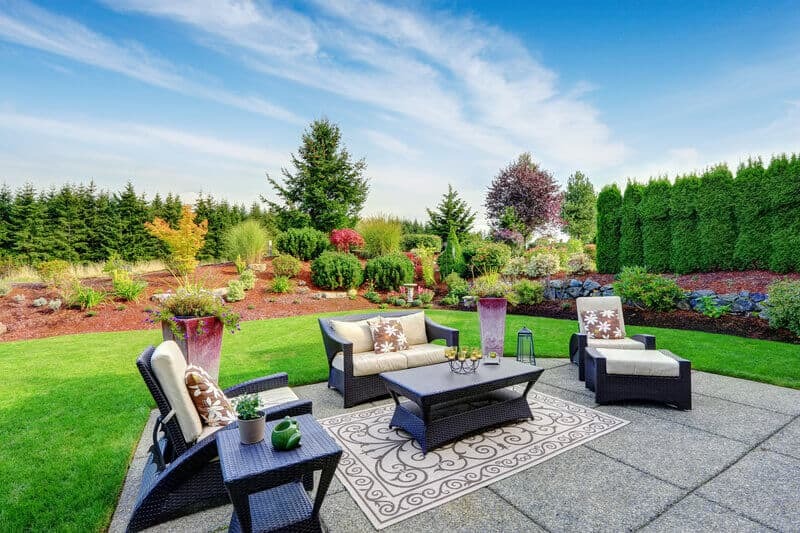 Whether coming up with your own front yard landscaping ideas or installing your favorite furniture, designing your home is a pleasurable experience that few other activities can match. Your space becomes your canvas for the world to see. However, sometimes it can be challenging to come up with enough unique ideas on your own. Looking for a little help, well you’ve found it right here! 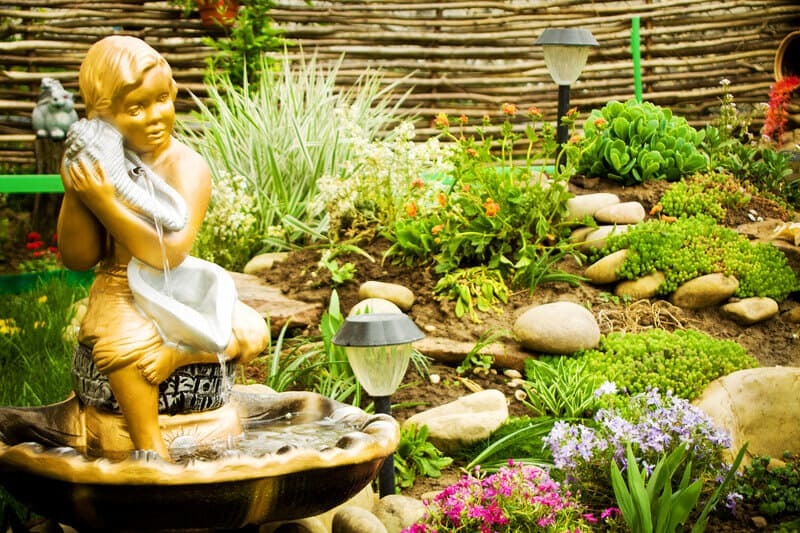 Our landscaping pictures of water fountains, garden entrances, stone walkways and more will push your backyard ideas to heights you never thought were imaginable. If you can dream it, you can do it! 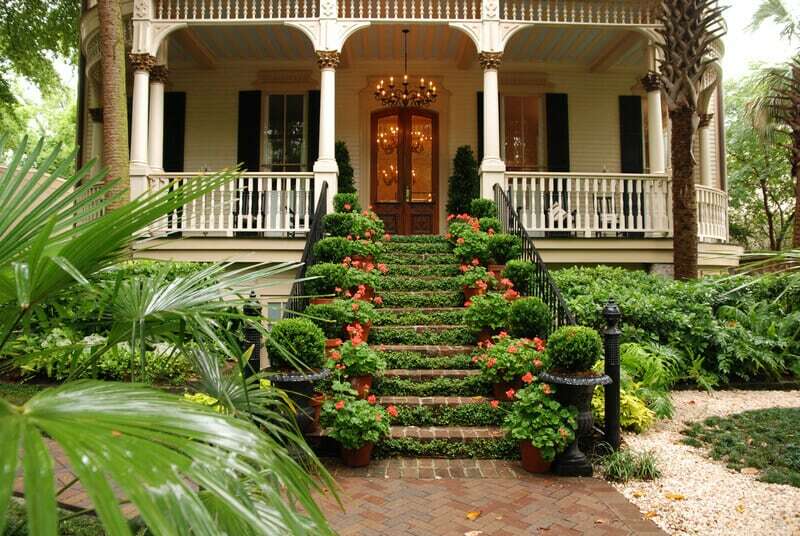 Imagine redoing your entire front porch staircase with gorgeous ivy and potted plants. 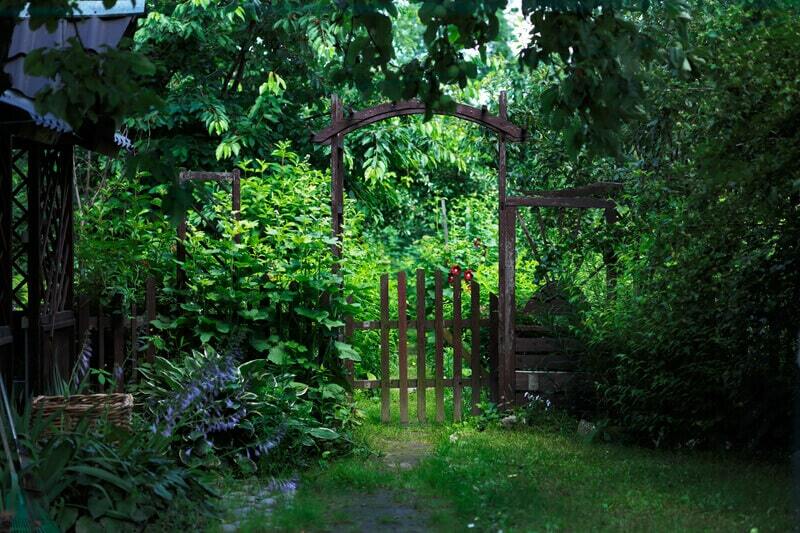 Imagine building a regal wooden archway at the entrance of your garden. Imagine learning about flowers that you’ve never even heard of before, but falling completely in love with them once you discover them. This is the joy of being a master of your own space, to be able to take your outdoor living areas and mold them as you see fit. 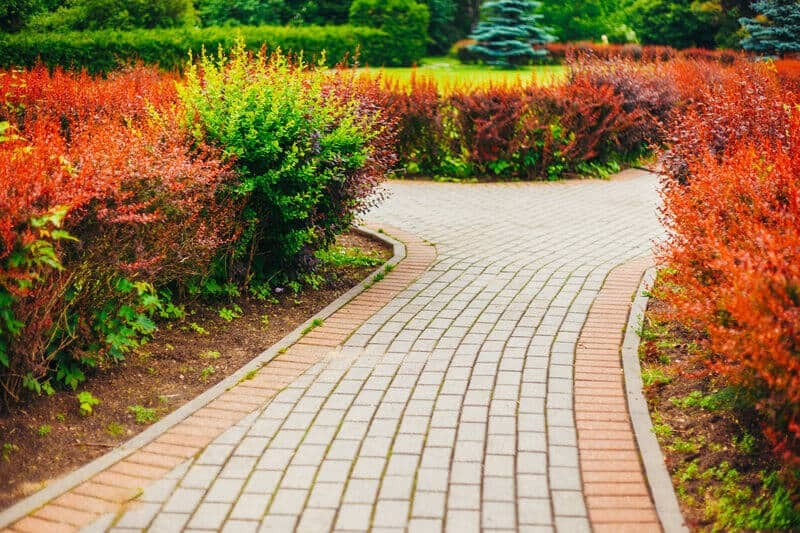 With the help of tips from this article you can now create the landscaping masterpieces that you have always dreamed of. This article features photos of ponds, patios, front yard designs, and more. You will be amazed at what you can do once you’ve been sufficiently inspired by the ideas presented in this article. 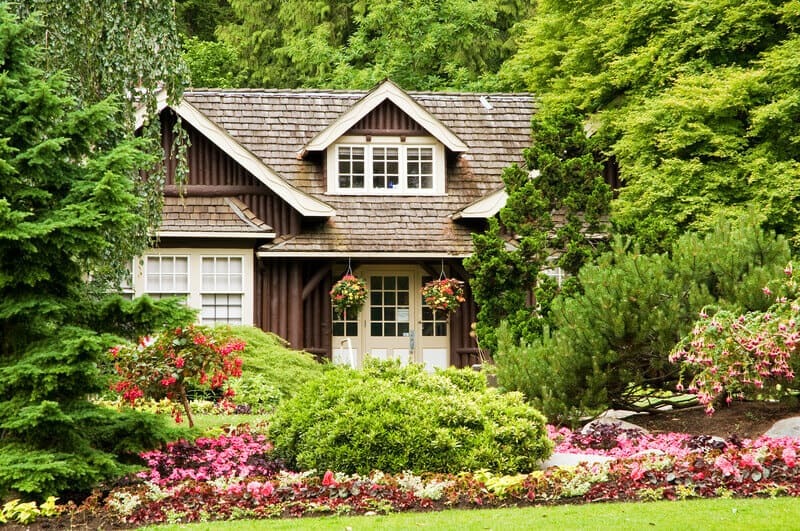 As a homeowner you owe it to yourself to create the best landscape you can muster. But you don’t have to do it alone. Let us help you revisit your old space with new ideas. Picture us as your personal assistants. 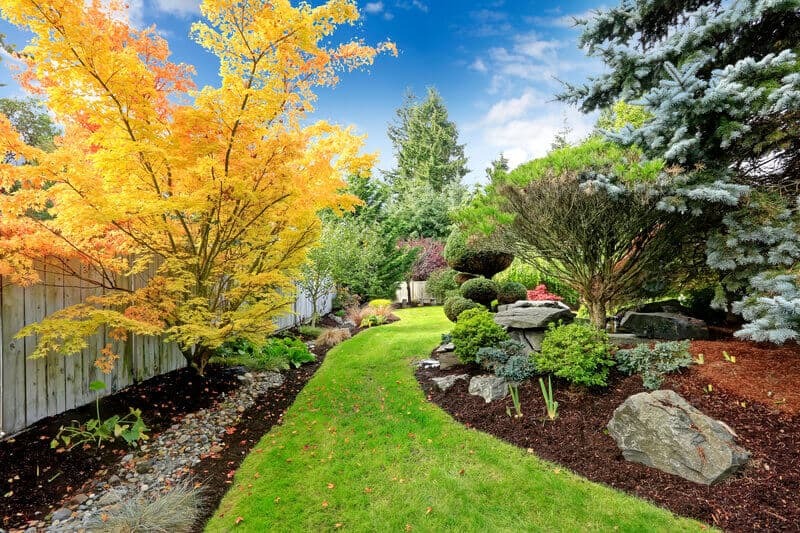 We’re happy to help you move along towards creating the backyard and front yard of your dreams. We hope you enjoy the article and our design galleries. 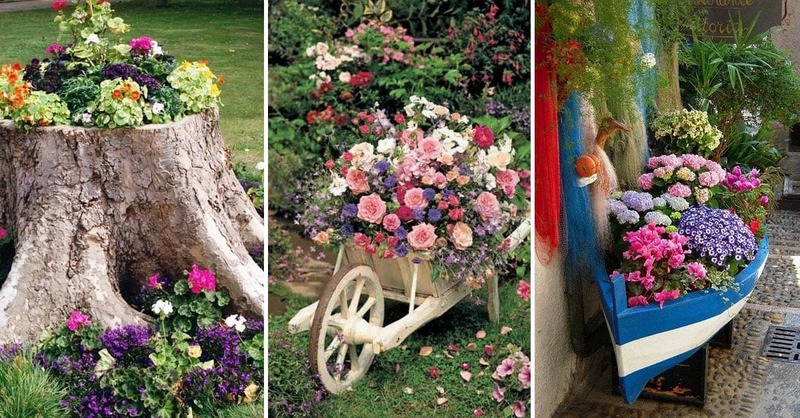 Having a wide assortment of flower times creates variation and freshness for your outdoor area. 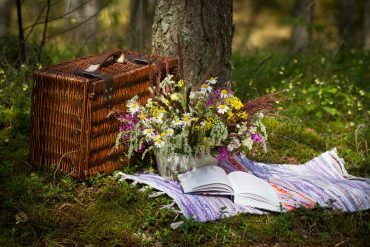 Use flowers as your paintbrush, while leaving the green grass and brush as your canvas. The trees with pink accoutrements adds the extra pop to the visual scenery of your area. The final, and most amazing addition. 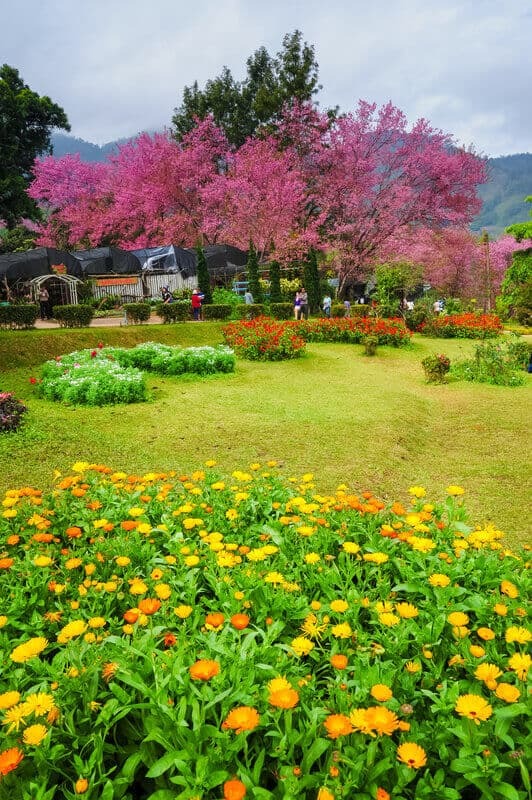 The pink color of the trees is supported by greens, reds and yellows. 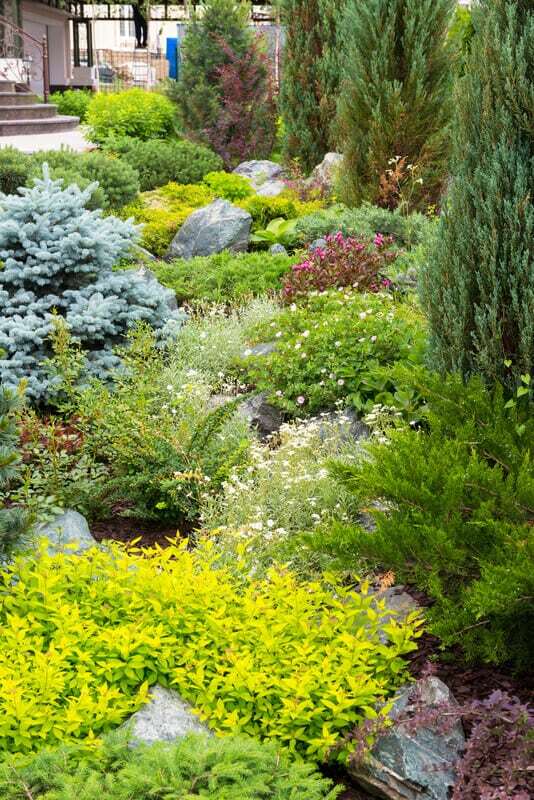 Consider adding assorted sizes of pointed and round shrubbery to your area for a more regal look. Experiment with different hues of dark and light green shrubs to add depth to your scenery. For the base of the shrubs, use a different kind of plant, like those with pointed leaves for some more variation. A shooting water fountain can’t hurt as well! 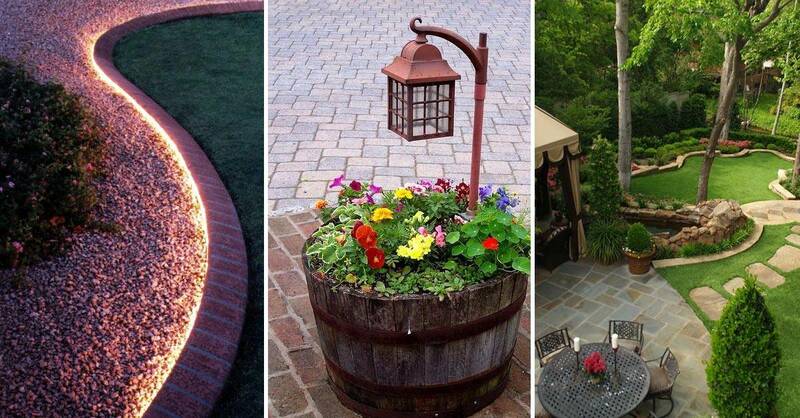 Mix up your garden design with fountains, stones and lanterns. This home garden scene uses a mix of all three against a background of a brown fence made with thin, long pieces of wood, adding a bit of a rustic feel. 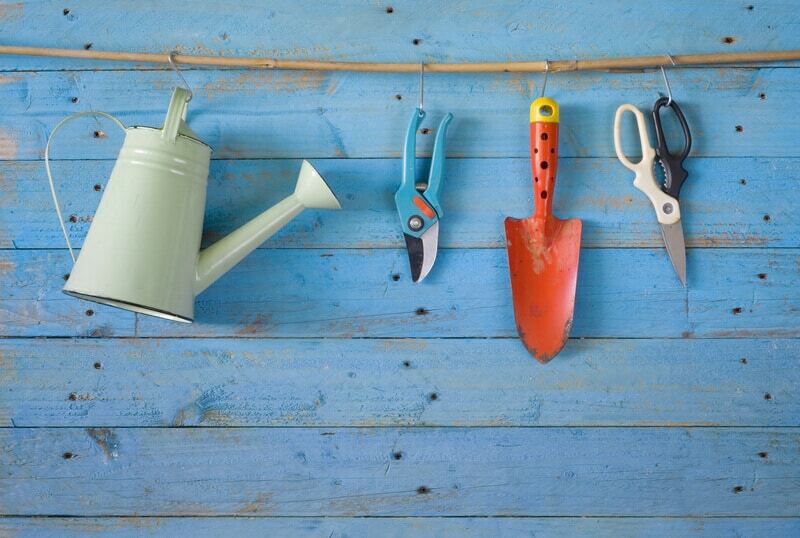 Experiment with different varieties of plants and flowers to find out what you prefer best. 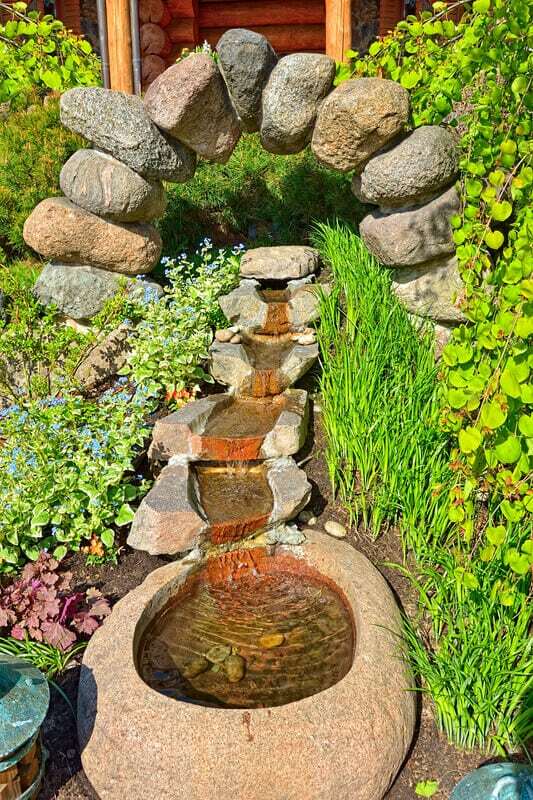 This garden features stones as a major set piece of its design. There’s even a unique use of stones being used as a monument. The square stones lying on the ground or light in color and in a uniform shape, which contrasts wonderfully with the stone tower on the right built with assorted stones. Flowers and shrubs are added tastefully to complement the scene. 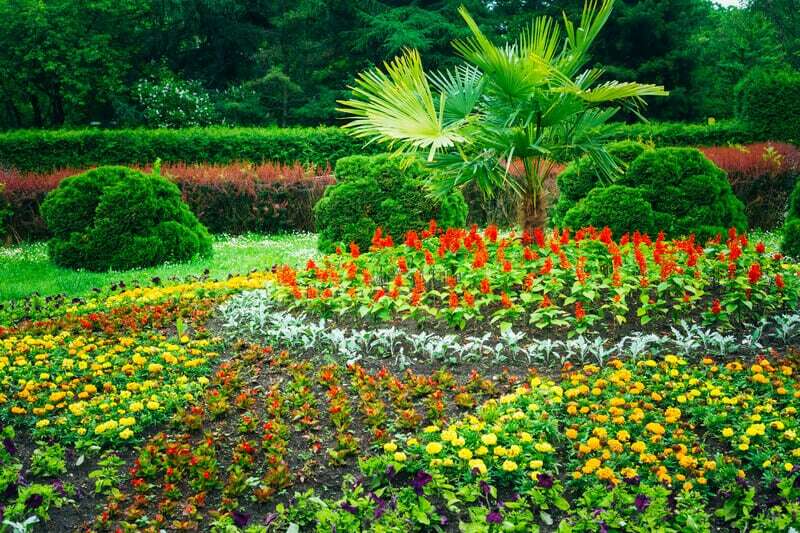 The same general type of flowers was used for this garden landscaping scene, even though the flowers themselves are of different colors. The centerpiece is the round circular area with red flowers, and a tall collection of ferns growing above it. Three shrubs are in the background, with a set of dark purplish plants behind them rounding out the scene. Adding a gazebo to your outdoor space allows you to observe the beauty of your yard from a comfortable sitting place. 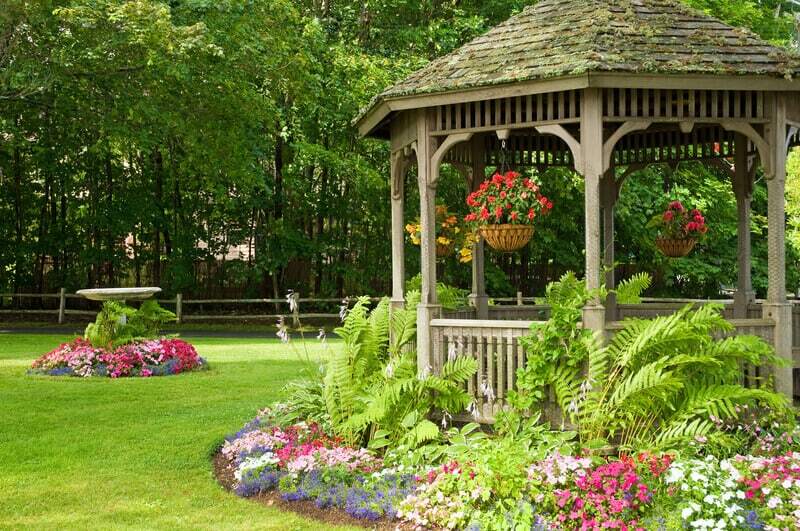 Adorn your gazebo with a variety of plants and flowers on the side to make your special place even more special. Add potted hanging flowers to the ceiling and assorted tall and short ferns on the outside. Try using taller trees and shrubs to enhance your area. You can also enhance your environemnt large stones places in specific, spaced-out areas. This scene has a diverse, asymmertical variety of plants, leading the viewer’s eye to observe many areas. Notice the brightly colored shrub in the foreground, which ads a spash of color to the uniformly green area. The small purple bush has the same effect. 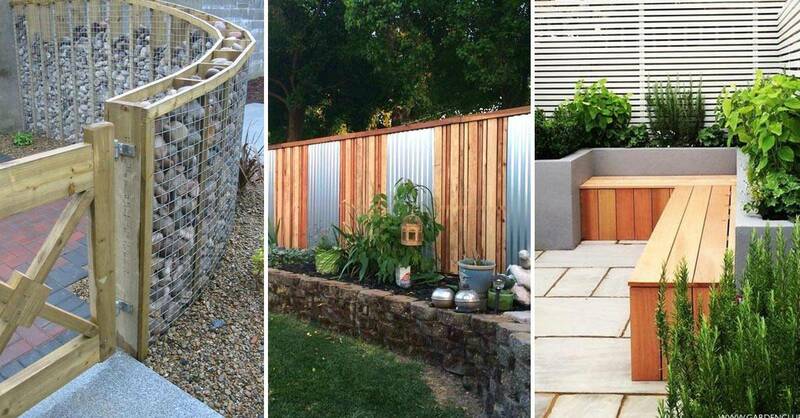 When you trying to think of more DIY backyard ideas to try, take a chance to think outside the box – by using curves! This backyard features a rounded feature not commonly seen in many backyards, giving it an easy, relaxed, fluid appearance. The reddish-brown trees in the background are another great touch, as well as the unique, conical-shaped shrubs. This outdoor patio is a stunning addition to any backyard design. The grey tiles match nicely with the dark brown outdoor furniture. And notice the tall natural fence of trees in the right side of the yard. Colorful flowers adorn the bottom, specifically blue ones, which aren’t typically common. 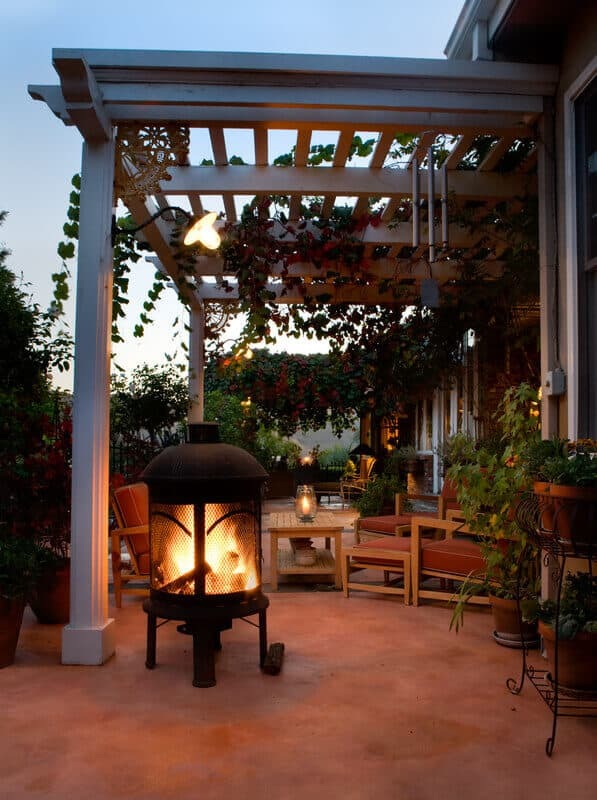 This comfortable patio features a fully functioning outdoor fireplace. There are also seats and a table so that the owners of the home can gather around and enjoy it. Notice the lovely vines wrapping beautifuly around the top of the open-air patio ceiling. Potted plants also adorn the area as well. 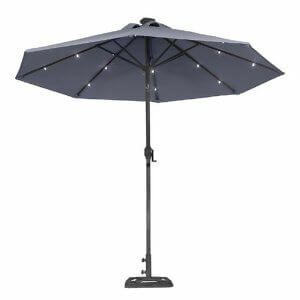 This is a large outdoor backyard decoration with dinner tables included. The furniture colors blend wonderfully with the stones on the ground and the cobblestone fireplace at the end of the patio. This backyard is a good example of using space to your advantage. The spiral brushes near the corners of the fireplace are an excellent finishing touch for the entire area. 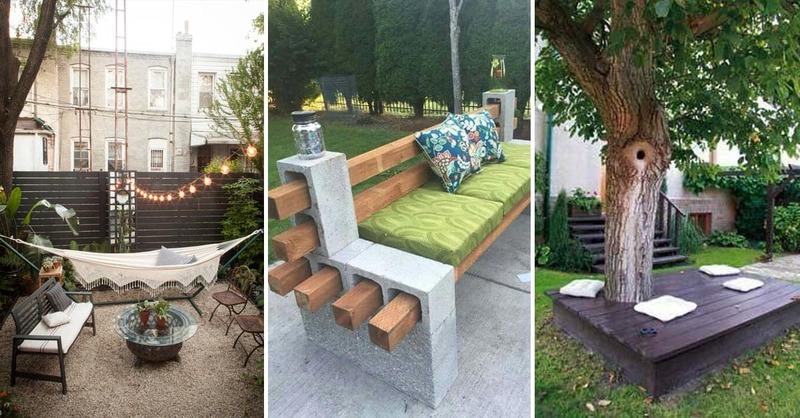 This asymmertical backyard design has a wealth of creative ideas applied to it. Notice the seat in the shade, keeping visitors away from the sun’s heat. 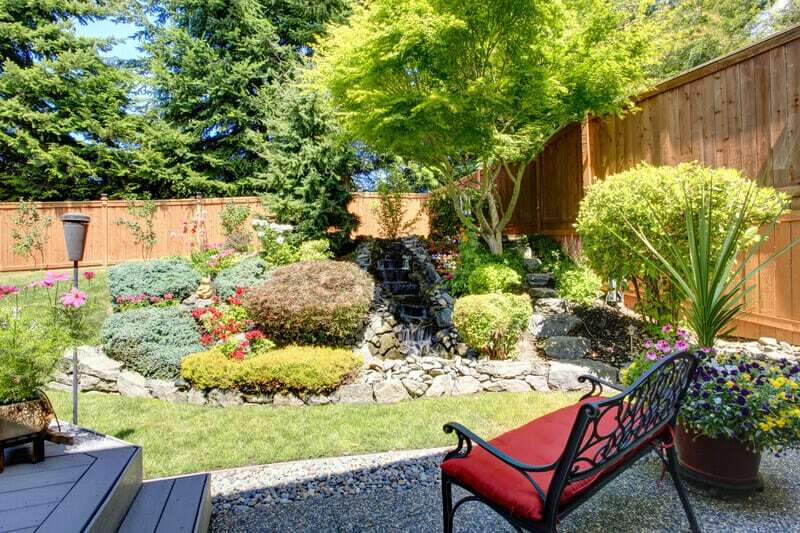 The wooden fence contrasts well with the multi-hued greenery nestled in the corner of the yard. The ground below the seat is neatly adorned with smaller stones rather than larger, another unique touch. 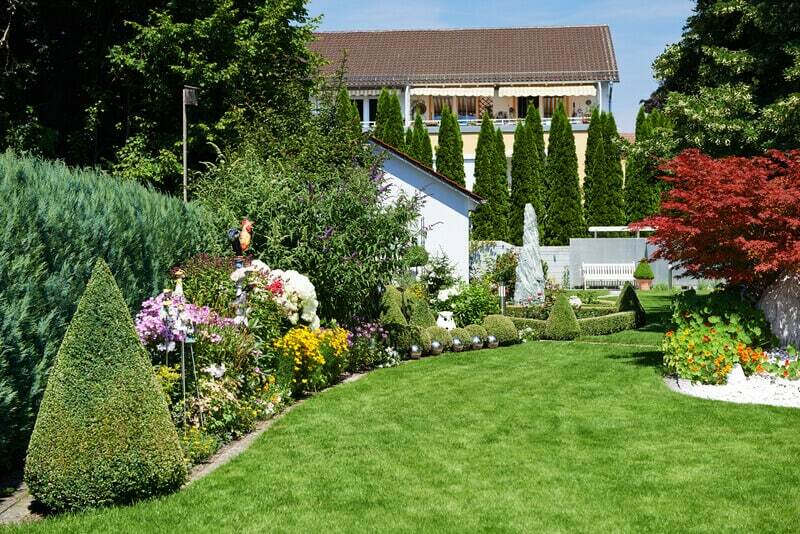 This location is one of the best examples of backyard landscaping. This backyard features a long, widing grass path as its main attraction. 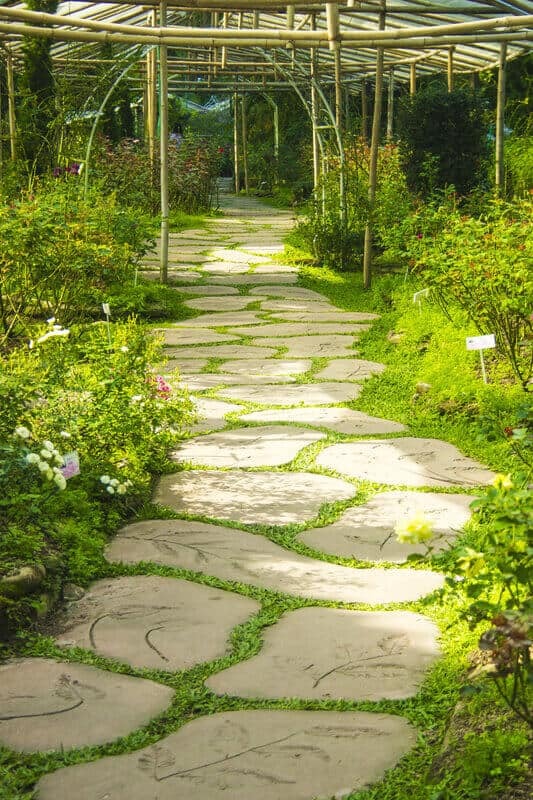 The path is framed on both sides by a variety of assorted stones and plants. The yellow tree and the light green pine attract attention gracefully to both sides of the path. This beatiful rustic-style barnhouse has a wealth of unique and amazing features to it. Focusing on the front yard, the rich, burgundy color contrasts well with the green grass and trees adorning the sides of the house. The vine wall near the outside chairs is noted as well. This front yard has numerous beautiful bushes and shrubs on display at the left side of the door. The potted plants on the stars are a nice touch as well. 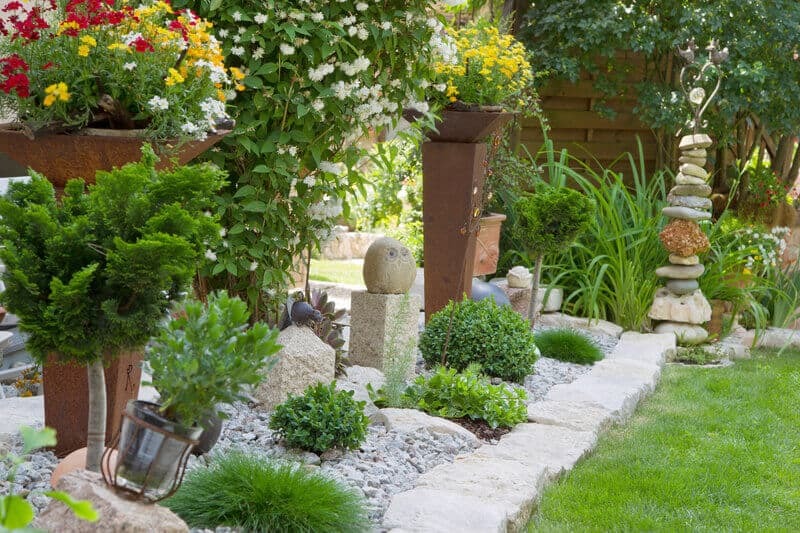 Also notice the deliberate blending of small grey stones and brown soil, a great example of natural landscaping. The dark green shrubs in the background contrast nicely with the light colored house wall. 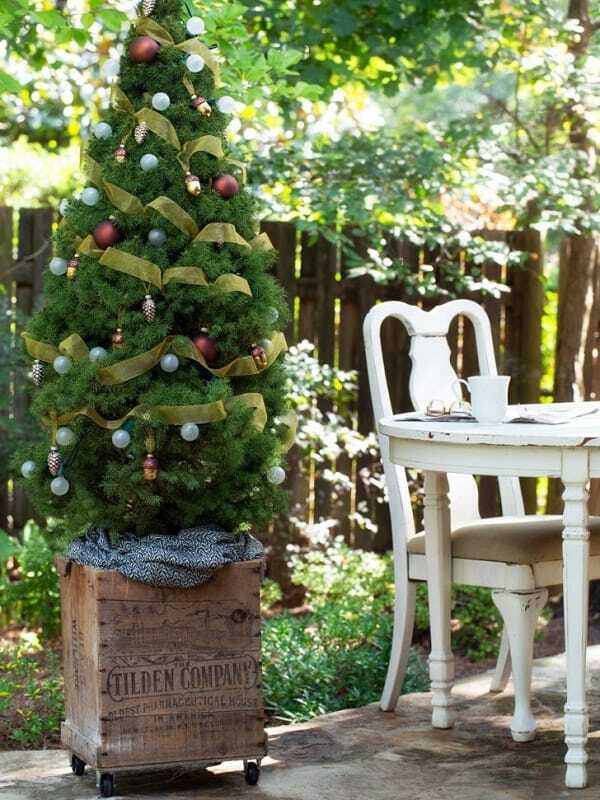 A cozy log cottage is beautifully adorned with greenery of all shapes and sizes. The hanging flowers at the front of the entrance provide an inviting feeling to the area. The secondary color of purple flowers are found in numerous areas around the front of the home. 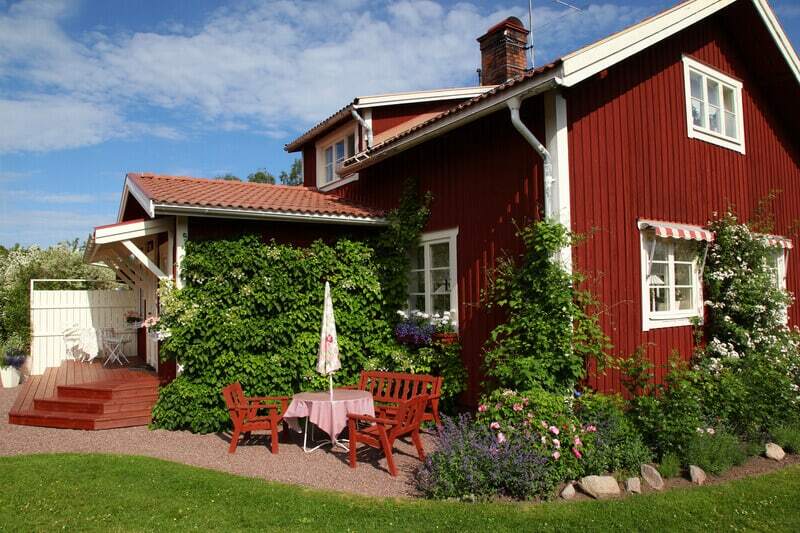 Using just two colors against the light brown background of the house produces a striking visual appearance. This front yard is all about the bare necessities, but the owner still maintains a wonderful outer appearance. 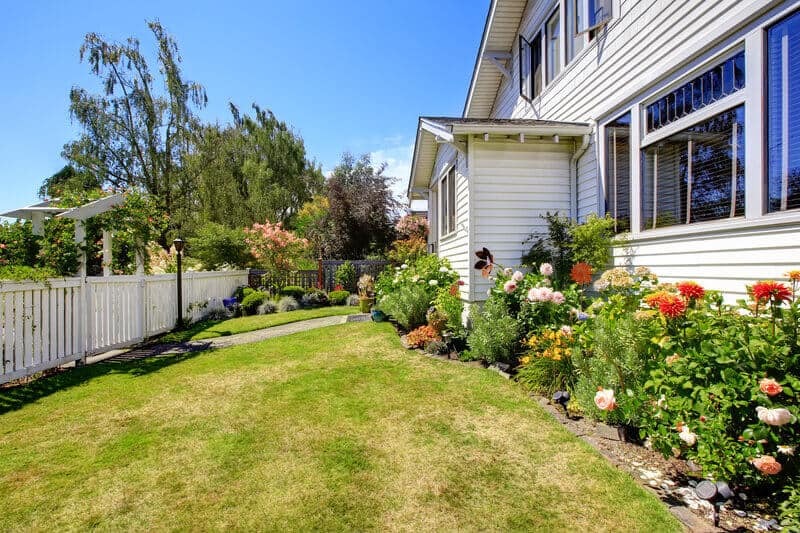 Inbetween the pristine white fence and the home is a clean swath of grass. In front of the house, along the front wall, are simple shrubs with basic colored flowers dotting the shrubs in different, specific areas. 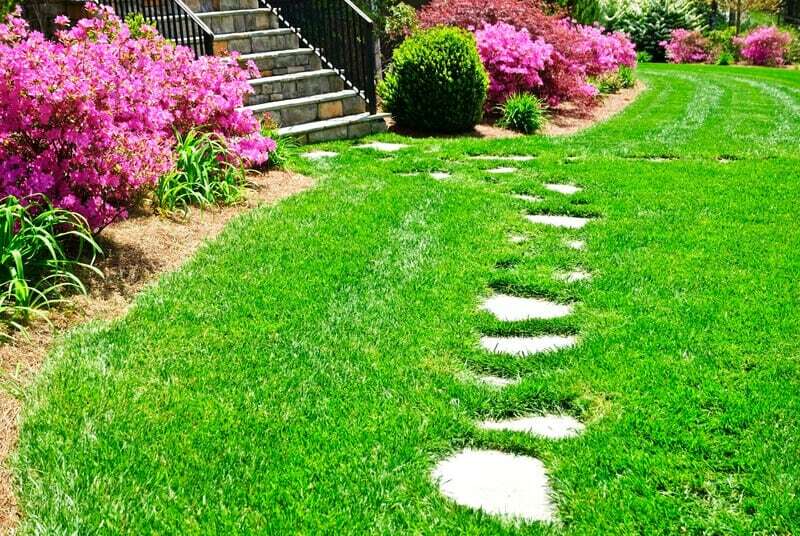 This picturesque front lawn includes fuschia azalea bushes, green fescue grass, and a path of stones leading to the front steps of the house. The vivid fuscia colored bushes adorn nearly every area of the front yard, providing a bright, inviting feel to the home. Added to the background are the smaller green bushes and ferns. This historic colonial home has a unique use of bushes and ivy vines to create a welcoming staircase. The vines adorn the front of every staircase, while at the same time not touching the tops so walkers can traverse safely. In the small bushes on the side of the starcase you can see red flowers dotting the bushes. 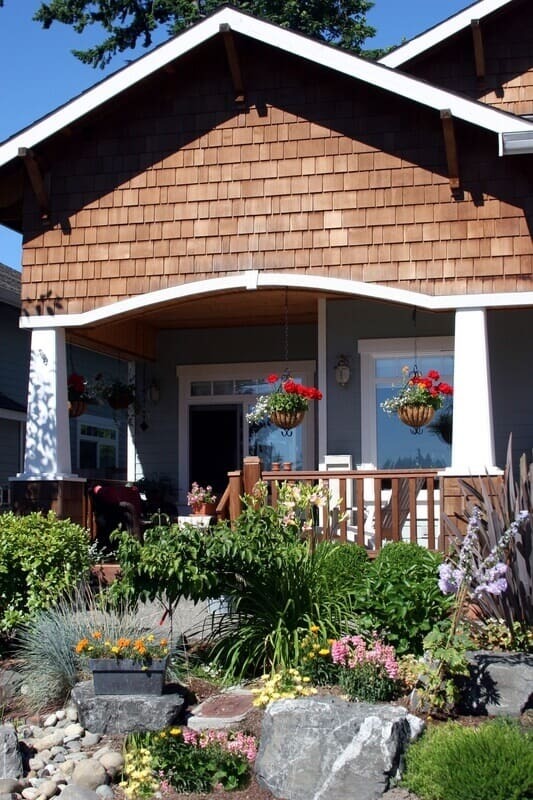 The front yard of this craftsman style home features hanging flowerpots, leafy ferns, and a big emphasis on stone. The tall purple fern on the right is a welcome addition of color to the scene. While most of the stones are large, there are some small rounded stones that can be seen. This lengthly stone path is the star of the show here. These stones are uniform in design, yet still varied and unique in shape. They are most likely made professionally by an artisan company. 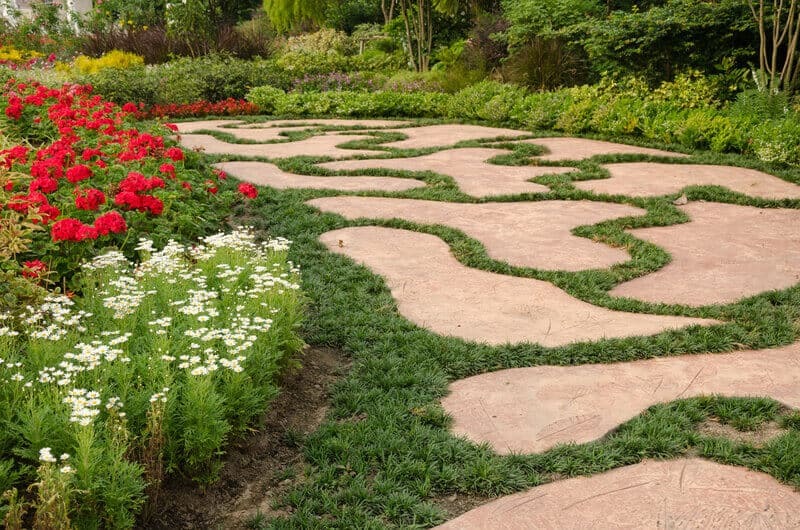 Each stone is carved with a leaf design inside, adding to the motif of this flower garden. The vivid green grass and brush complement the cool gray of the stones wonderfully. Uniform brick stones are laid along this pathway’s length. The light gray stones are a good primary color that contrasts against the red bricks along the edge. Also noticable are the medium sized red bushes surrounding the path which compliments the gray and red path stones. Some green bushes are a nice touch as well. 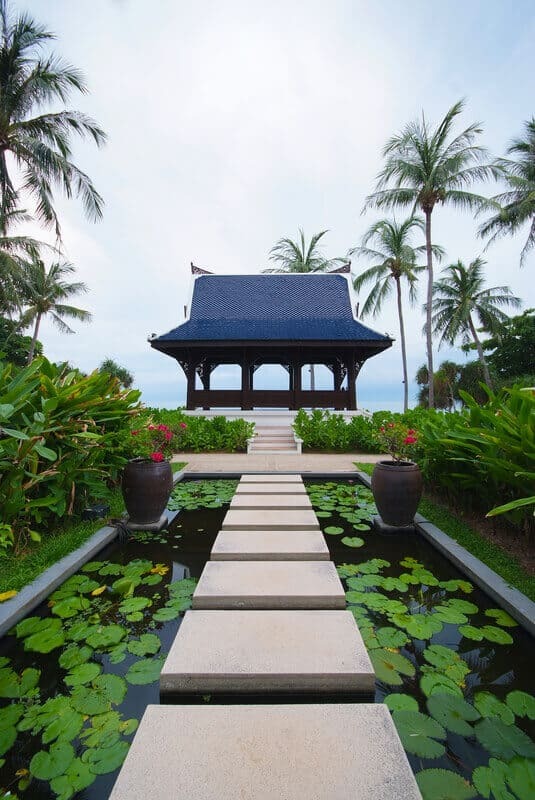 Thailand is known for its beautifully constructed outdoor environments built with a focus on natural beauty, and this walkway reflects that. 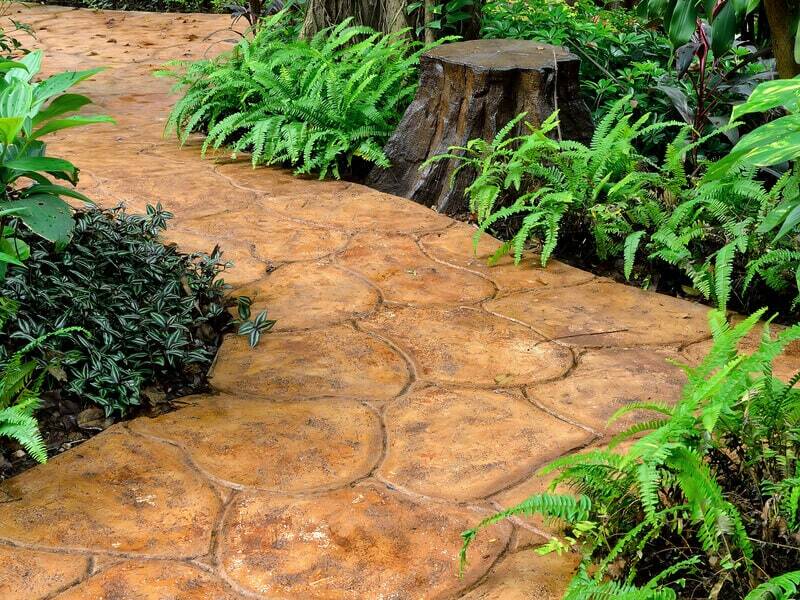 This garden features light brown rounded stones embedded into an angular walkway pattern. The ferns around the walkway compliment the coloring of the walkway quite well. 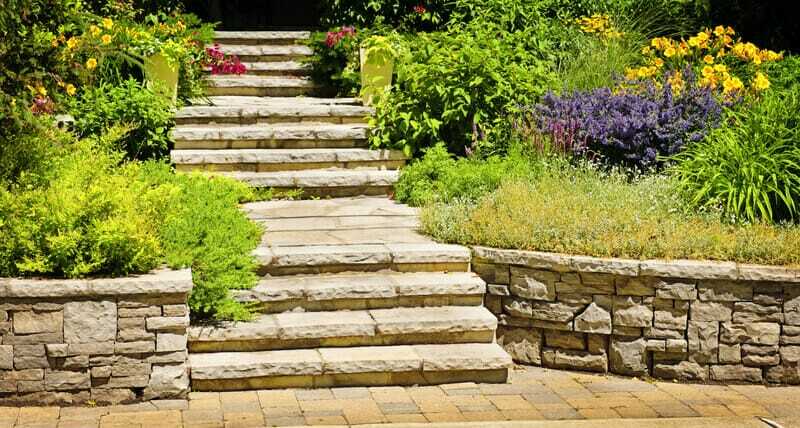 Check out this natural stone landscaping design. 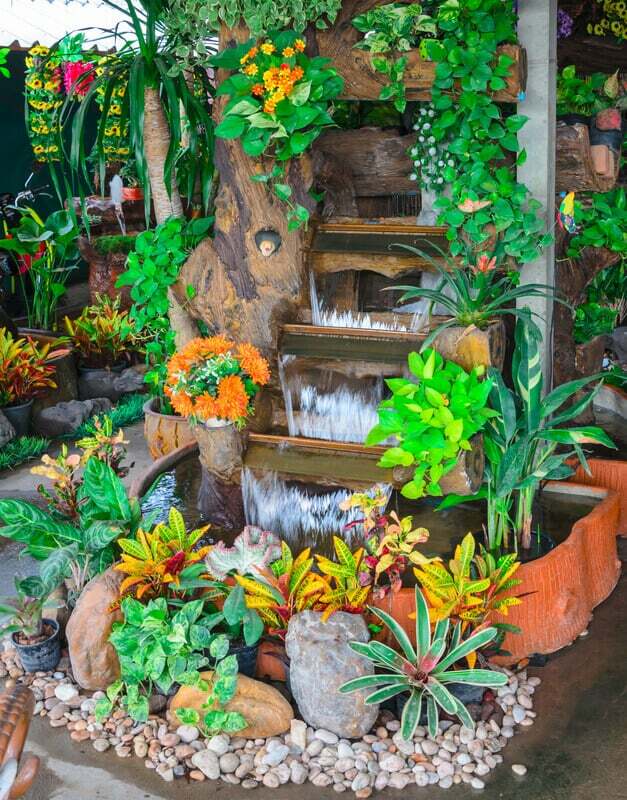 This is a home garden with stairs included in its design. The stones in this garden are square, light grey, and fairly uniform in style. The greenery overflows from both sides of the stairs. Multiple styles of plants are displayed. 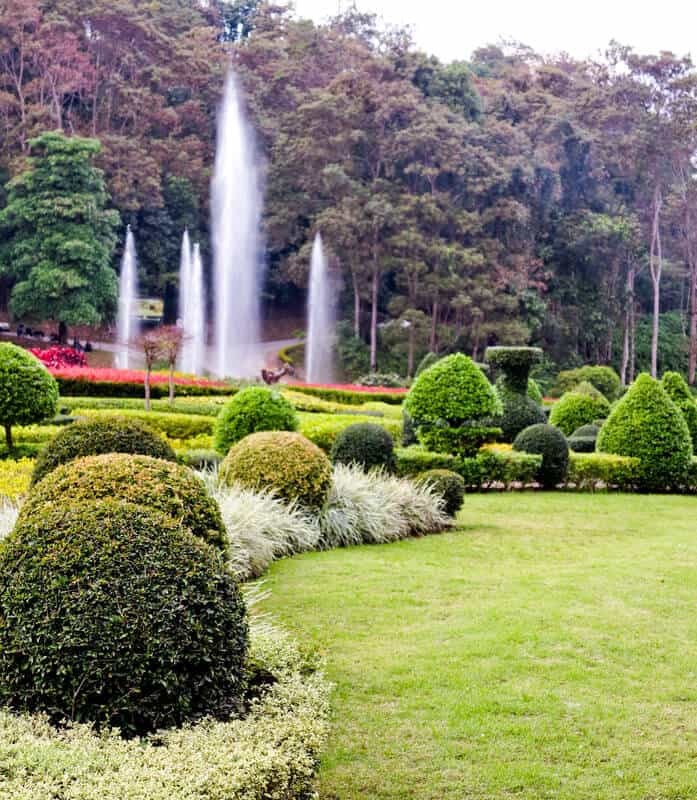 This is another example of a beautiful garden pathway also found in Thailand. The round, irregular stones are complimeted by the grass surrounding them. The beautiful flowers on the site serve as a border for the pathway. Green shrubs in the back of the picture set the tone for the entire area. This walkway is made entirely of red brick. The primary colors of this area are green, a light pinkish-red, and white for the monuments in the background. 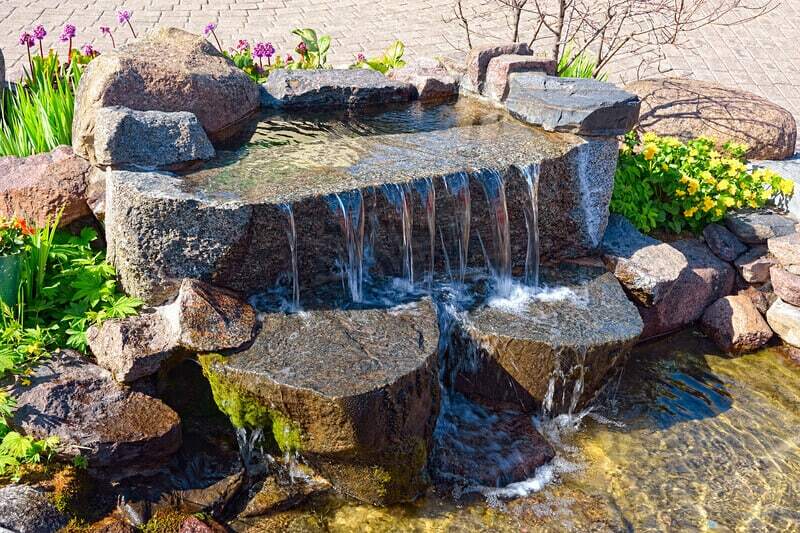 You can use this picture as inspiration for a pond or fountain in your own home. 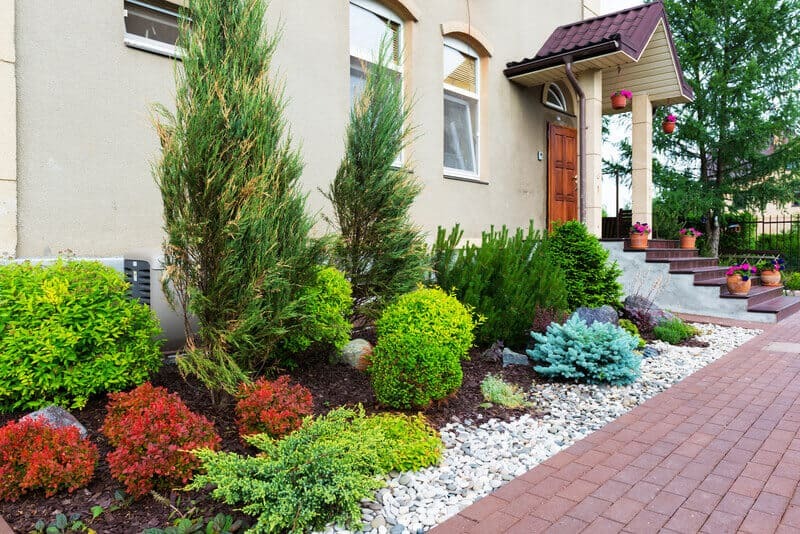 Small shrubs are adorned on the sides of the walkway to add extra flair. 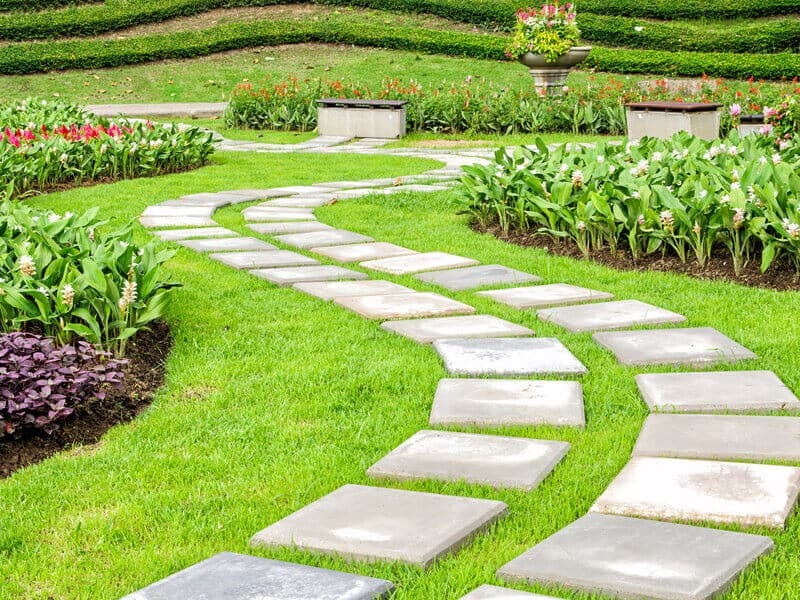 Try experimenting with square shaped stones when you construct your pathway. 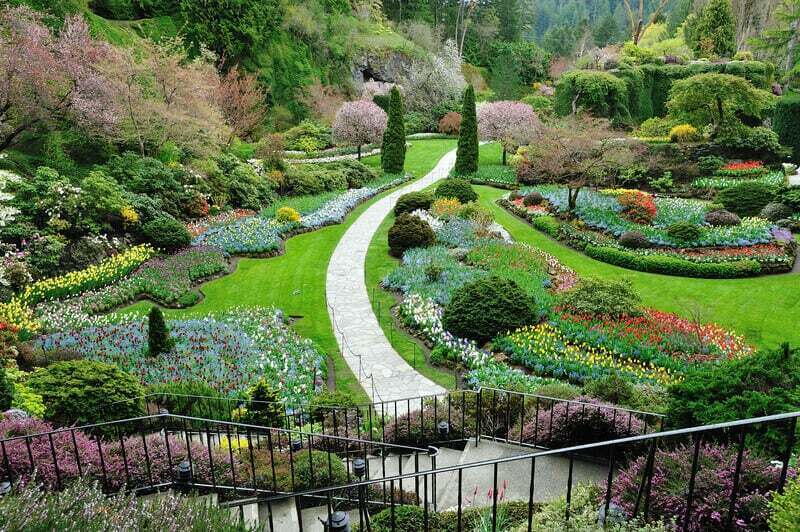 This garden has fresh green grass and a tiled pathway that winds towards the hills in the back. Red flowers and purple flowers adorn the back of the landscape. This is an amazing piece of scenery that can’t be replicated anywhere else. 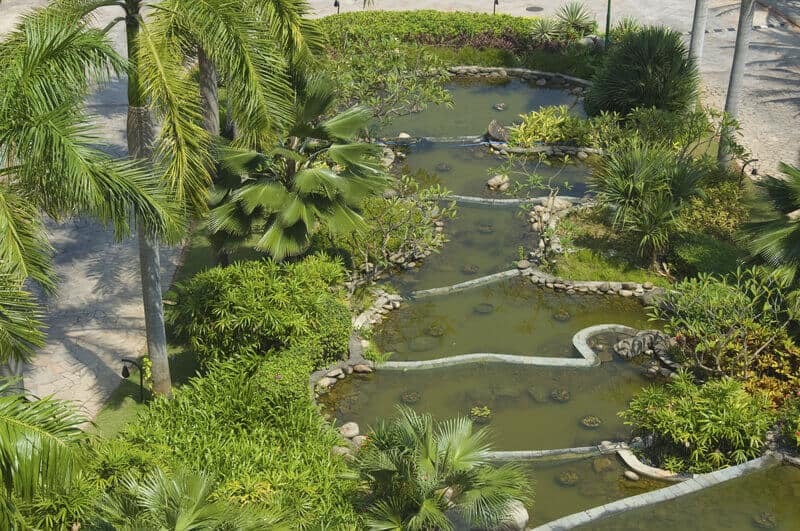 This Asian style pond features two different paths in one. The first path is a set of three large stones set into the pond, while the second path gracefully winds towards the right and continues onward. 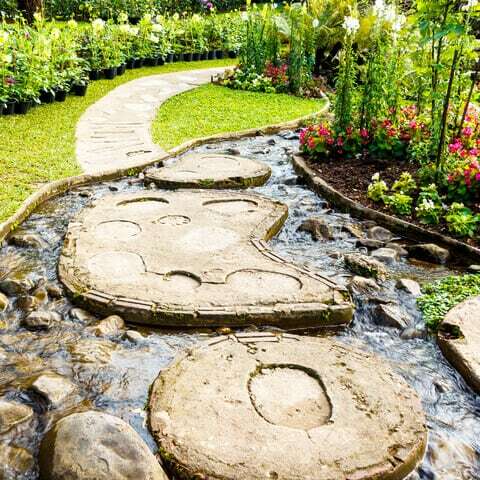 A path that features water is amazing, stylish, and very pretty to look at. The tall tree-like flowers around the area make this location even better. 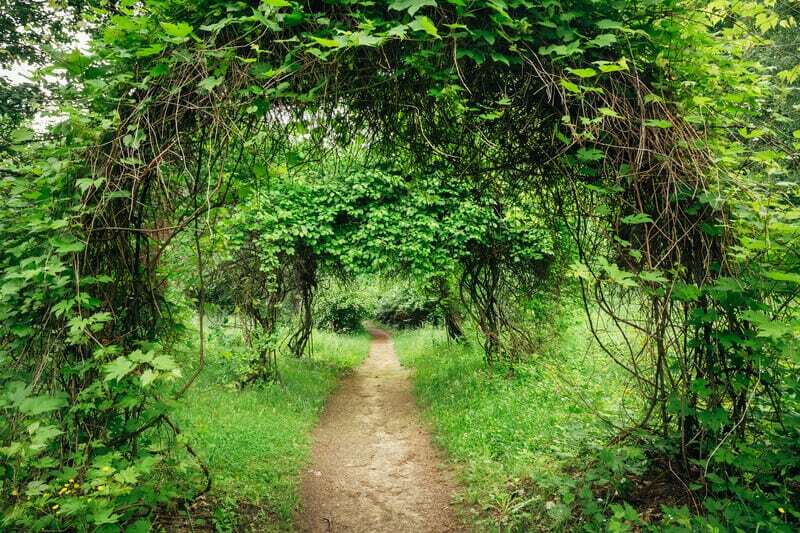 A gorgeous walkway that features trees organized in an arch formation. The uniform green color of the environment serves to guide the eye towards the center of the walkway. 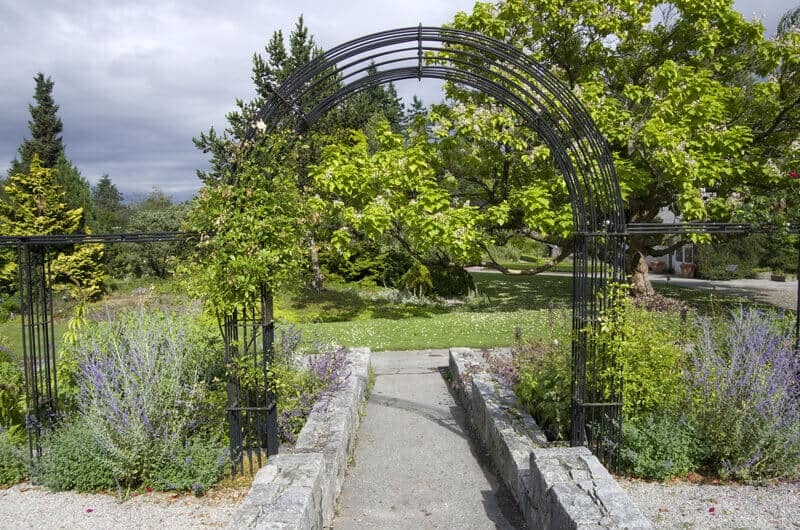 VanDusen Botanical Garden in Vancouver features a beautiful metal arch in its walkway entrance. It is held up by the strong, light-gray stones at the bottom, which are also bordered by shrubs. 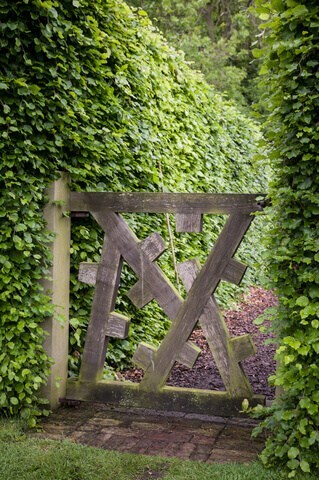 Wooden garden gates don’t have to be boring. Here’s a gate that features uniquely shaped wooden posts arranged in an unconventional, yet striking style. This is a nice wooden gate with a wooden archway suspended over it. It looks like you are about to step into a fairytale. 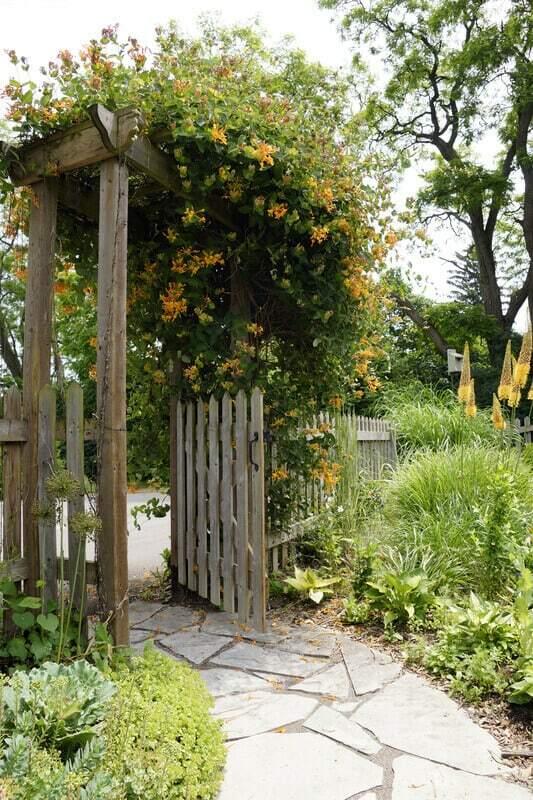 A hearty collection of honeysuckle vines entices visitors at this gateway. The wood structure of the gateway seems old, but that adds to its charm. Also notice the walkway made with flat, irregular polygonal stones. Busy looking entrances can be beautiful, too. 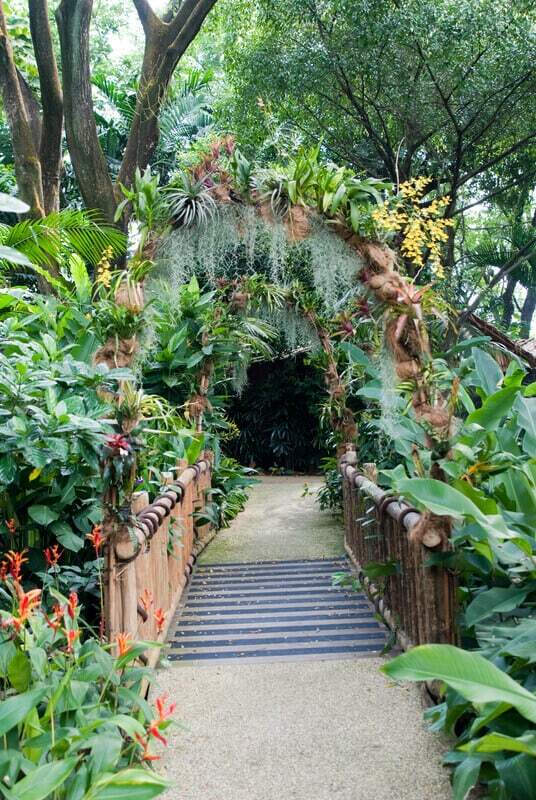 This walkway showcases a dizzying assortment of plants, flowers, ferns, and vines. It was a deliberate choice to have the plants of this walkway be predominantly green, with mild yellow and red undertones due to the flowers. 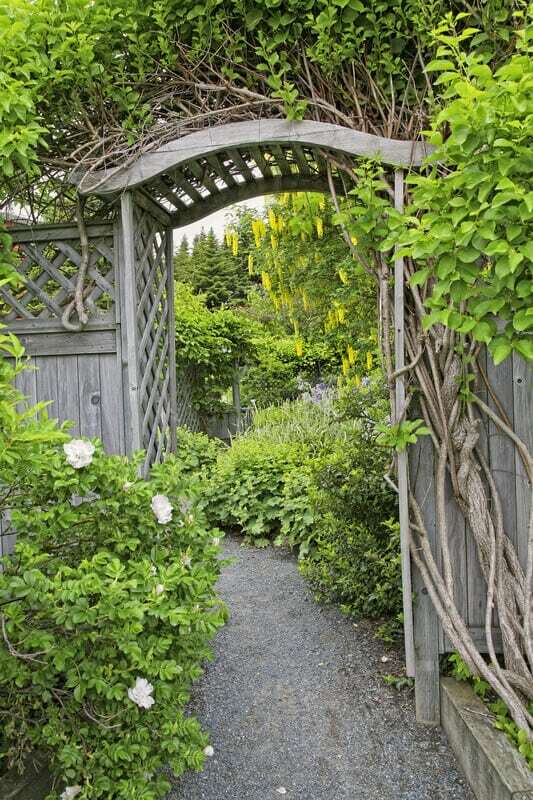 This entrance is constructed with a lattice wall, which makes it perfect for vine growing. It’s a wide arch with ample room for plants on top and bushes on the bottom. 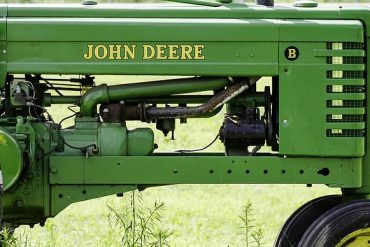 This water fountain’s style is reminiscent of the large water wheels that were in use throughout American history. The small plants placed everywhere on the outside of the fountain are a nice touch. A refreshing addition to any outdoor location. A water garden with a small waterfall and pond surrounded by green foliage and flowers. Stone arches for a fountain? They’re more likely than you think! This small fountain has its water empty out into a larger, hollowed-out stone. 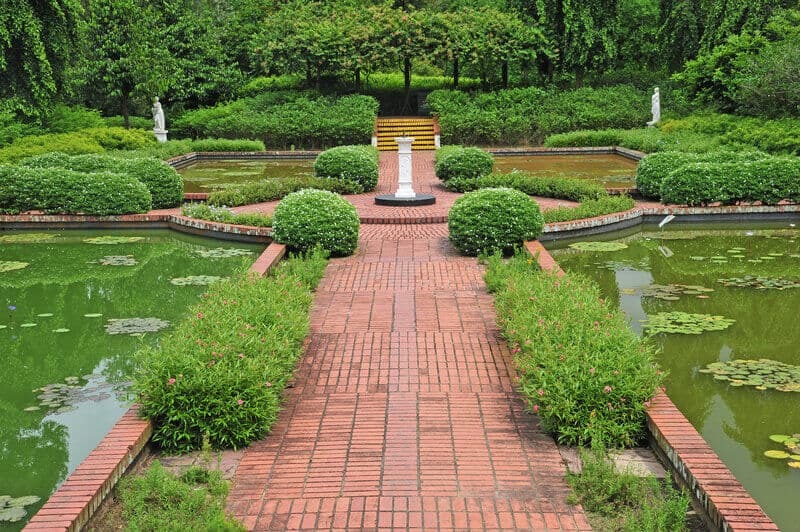 Here’s a peek at a water garden created by a Chinese hotel. 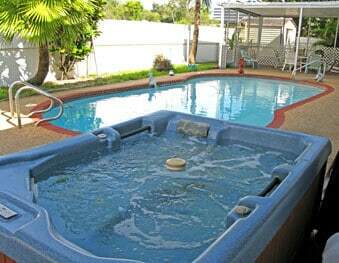 The water fountain is created in a step-down tier format with multiple ponds. This structure is surrounded by short shrubs and small trees. A pristine stone walkway suspended over a pond of tropical water lilies. Two pots filled with a few flowers are included on top of the pond. Great ideas. 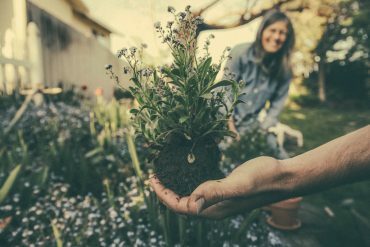 Don’t crowd your front yard with lots of objects or plants. Have a clear structure to the design with a focal point.